CNN’s POLITICAL GUT CHECK | for June 4, 2014 | 5 p.m. Gut Check Full Service: National Republican Senatorial Committee Vice Chairman Rob Portman, told CNN that the NRSC will continue to support Cochran. "We have three more weeks and we'll continue to do what we've been doing," Portman said on “The Lead with Jake Tapper.” Asked if the negative attack ads in the race should be toned down over the next three weeks, Portman said, “I think it would be wise on both sides." HOG WILD IN IOWA: State Sen. Joni Ernst didn't have to take sides in the battle between grass-roots conservatives and the Republican establishment. She had the backing of both, and she easily came out on top in a crowded, five-way primary race. OPEN PRIMARIES HAVE CONSEQUENCES: Democratic Gov. Jerry Brown and Republican Neel Kashkari finished in first and second place, respectively, and will advance to the general election in November. INCONSISTENCIES FROM BOTH SIDES IN BERGDAHL DEBATE... CNN’s Jim Acosta reports from Warsaw: Late Tuesday, Democratic supporters of President Barack Obama’s decision to trade five Guantanamo detainees for Bergdahl’s freedom began circulating quotes from several GOP lawmakers who initially supported efforts to free the Army sergeant but who later criticized the swap. Republican Sens. John McCain and Kelly Ayotte were among the senators being called out for pivoting their positions. The Obama administration has had its own challenges presenting a consistent narrative about the deal that freed Bergdahl, including the decision to circumvent U.S. law requiring the administration to notify Congress about the detainee release from Guantanamo. Democratic Sen. Dianne Feinstein, the chair of the Senate Intelligence Committee and a frequent defender of Obama administration foreign policy, said she was disappointed the White House did not comply with the law. There were also inconsistencies over when Senate Majority Leader Harry Reid was notified by administration officials about the prisoner exchange. MARKET WATCH: S&P 500 reaches another record close as U.S. stocks tick higher ahead of the jobs report later this week. 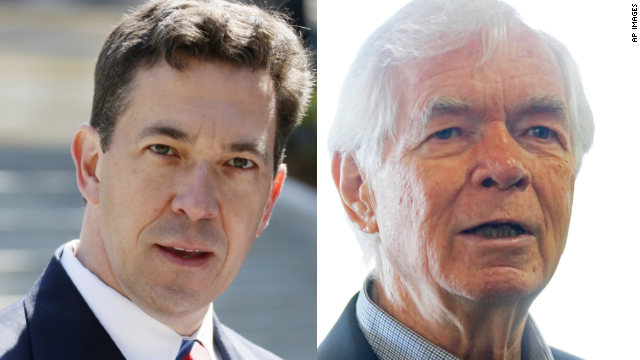 Who are the only two Mississippi senators to serve in Congress longer than Thad Cochran? FORMER REP. STEVE LATOURETTE IN A STATEMENT: "It is breathtakingly arrogant for the Club for Growth to call for a 6-term Senator, who may have actually prevailed on Tuesday once all the votes are counted, to step aside and not see the electoral process through." So People Magazine interviews Hillary Clinton....and asks if she has a "hair strategy for 2016." Excuse me as I bang my head on my desk. I think any question regarding appearance is fair game of a politician whose twitter bio includes "hair icon, pantsuit aficionado". So @TheHillaryBus will not only shadow Clinton's book tour, but also go to Dem events, state fairs & college campuses before midterms. @PhilipRucker @TheHillaryBus was at the White House yesterday, running down Obama on Bergdahl. so many average voters are going to confuse those two names MT @GutCheckCNN: Is #Bergdahl the new #Benghazi? Thad Cochran is the third-longest serving senator in Mississippi's history. First elected in 1978, he has represented the Magnolia State for 35 years, 5 months and 6 days. So who served longer? Democratic Sen. James Eastland served in the Senate for 36 years, 2 months and 24 days, from June 30, 1941 to September 28, 1941, and again from January 3, 1943 to December 27, 1978. But the record for the longest-serving senator from Mississippi belongs to Democrat John Stennis, who served for 41 years, 1 month and 29 days, from November 5, 1947 to January 3, 1989. Congrats to Ellie Shingleton (@ershingleton) for correctly answering today’s Gut Check trivia question. New Jersey Gov. Chris Christie will not tolerate stupid people who question his judgment ! It's a bridge people , so what ! "Maureen Dowd got so high on pot in Colorado she curled up in a ball and hallucinated for 8 hours. " Correction: Maureen Dowd got so high on pot in CO that she finally realized she's been hallucinating all this time. "“It is imperative that you lay out for the American people your vision for reforming what is clearly a broken system ... The VA scandal is a national disgrace, and Americans are eager to know the extent of your willingness to personally take action in order to make things right for those who have served.” – Rep. John Boehner. Rep. Eric Cantor. Rep. Kevin McCarthy, Rep. Cathy McMorris Rodgers"
Teatroll Rosetta stone says: "We've been in congress for years and years now and the whole time we've been there, the VA has been a blatant mess. We even served in Congress during the whole Walter Reed debacle. However, we would very much like to continue taking no responsibility for fixing the VA's problems, so we're going to pretend it's all on you." Well said. Clearly you are directing those comments at some other long term people in congress like Harry Reid and Nancy Pelosi, right? so many average voters are going to confuse those two names MT @GutCheckCNN: Is #Bergdahl the new #Benghazi?" Oh that's it. The radical conspiracy right can save typing ranting time by combining the two. Their science challenged base will not know the difference. Two for one. Raise the "Berngdazi" flags in imaginary anger. "Well said. Clearly you are directing those comments at some other long term people in congress like Harry Reid and Nancy Pelosi, right? I have CONSISTENTLY said EVERYONE with respect to this issue, tom. However, Reid and Pelosi aren't the ones trying to shift all responsibility and blame to Obama....the GOP/Teatrolls are. Cut the crap. Happened under gop watch tom, the Walter reed was when this should have been fixed, you don't think Obama catches blame for everything? He can do no right according to the gop, you still believe that trickle down economics works, not even the gop tries pushing that BS anymore . He had been blamed for things that he has no control over, you really don't think the rwnj sound like juveniles? Intelligent, mature people have been tired of the obstruction, and daily campaign they put on for their masters, on our dime. You don't think 50 repeal votes is not a waste of time and money, you hate it, we get it, like the second vote, but here we are, wondering when they will find it as ridiculous as we have years ago? Why no governor of the year award Christie, lmao. Liar of the year, his statement was what, 97% true, I'm not sure you can find that just anywhere these days, yet the rwnj were all uppity about it, your not winning any new recruits, just exciting the natives. The VA problem is a symptom of "leading from the rear" But please, don't blame Obama......he didn't know, even though he talked about it on the campaign trail. He shouldn't be blamed for ANY of it because................................he didn't know! I need some talking points from...................................Susan Rice. You just don't get Sniffit's comments do you? There's a mess, a bad mess but trying to blame it solely on Shinseki first ( we won, not that firing him does anything to solve the problem) and now Obama alone is responsible/ accountable. Pure unadulterated IGNORANCE , POLITICS AND NONSENSE. Especially when the last bill to make improvements allowing outside private medical institutions to give care was Filibustered by republicans!? Ugly inside out vs ugly. What a pair! @TomI, at least Pelosi and Reid are not trying to destroy the country like the teaklans and their Canadian leader wants to so . . . . . . .